DNP Photo Imaging America has revolutionized dye sublimation printing with DS Series™ printers. DS Series printers are high-speed, high-quality photo printers for use in photo labs, photo kiosks, by professional photographers, or in other commercial applications. The DNP DS620A printer offer unparalleled reliability and ergonomic design for easy access and front loading of media. The DS620A printer is the world's most compact professional-grade photo printer that can produce up to 400 prints per hour. With its improved thermal print head, DNP IAM is including a 3-Year Advanced Exchange Warranty out-of-the-box! The DNP DS620A printer incorporates DNP's high quality, value-priced media and a high resolution printing that produces rich photos that display full color details and smooth gradation.The new media offered for the DS620A printer features a DNP watermark on the backside of each print and a newly improved gloss or matte finish. T he lamination layer on the media provides resistance to fading , fingerprints, water, ozone and dust. The DS620A features an enhanced thermal print head and print engine system for years of trust performance. To prove it, DNP is includeing an optional 3-year Advanced Exchange (AE) Extended Warranty with the printer. Designed for high performance in a compact size, the DNP DS620A is even lighter in weight and has a small in footprint than the DS40 printer. The DNP DS620A printer weighs only 26.4 pounds and it's dimensions are 10.8 inches wide by 14.4 inches deep by 6.7 inches high. The DNP DS620A is capable of producing Glossy and Matt finishes from the same media, which are conveniently selectable from the printer driver. 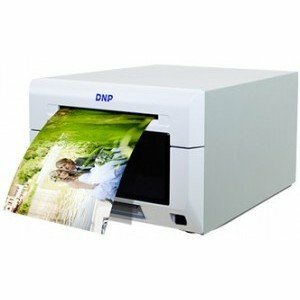 The DNP DS40 printer is capable of printing 2x6 cuts on 4x6 media, making it a perfect printer for Photo Booths and it can also produce 3.5x5 prints from 5x7 media. The front-loading operation on the DNP DS620A makes it easy to replace paper and ribbon, allowing the DNP DS620A printer to be used in the tightest of spaces. The DNP DS620A operates at high speed, producing an 4” x 6” sized image in approximately 8.3 seconds. The DNP DS620A printer offers easy color adjustment via its printer driver property. This incorporates a preview image that can be used to easily confirm and adjust images. The DS620A printer also provides advanced status information from the driver, enabling users at any time to check remaining media, media format, printer status, printer life counter, color control data, firmware version and serial number.